Abstract Artist Helen Frankenthaler Dies At Age 83 At a time when the art world was still dominated by men, Frankenthaler's canvasses earned the respect of critics and influenced generations of artists. One of the major abstract expressionist painters of the 20th century, Frankenthaler died Tuesday at her home in Connecticut. At a time when the art world was still dominated by men, Helen Frankenthaler's abstract canvasses earned the respect of critics and influenced generations of artists. One of the major abstract expressionist painters of the 20th century, Frankenthaler died Tuesday at her home in Connecticut. She was 83 years old. In the early 1950s, Frankenthaler started painting with her canvasses flat on the floor after seeing Jackson Pollock do it. She liked the gesture and the attitude of working on the floor, she told NPR in 1988, "but I wanted to work with shapes in a very different way." 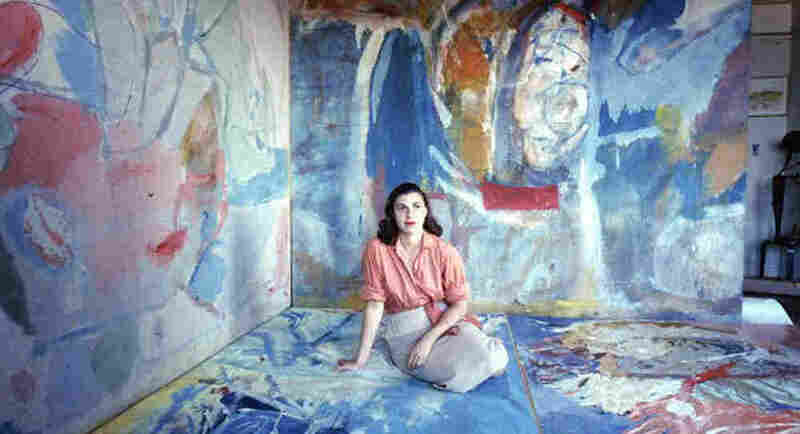 Frankenthaler developed her own technique of pouring diluted paint directly onto canvas, then manipulating it with mops and sponges to create vivid fields of color. "What evolved for me had to do with pouring paint and staining paint," Frankenthaler explained. "It's a kind of marrying the paint into the woof and weave of the canvas itself, so that they become one and the same." She really helped pull art out of the angst and trauma of the abstract expressionists, the wartime generation, and into a lighter, more lyrical kind of modernism. I think it was a relief, a liberation. 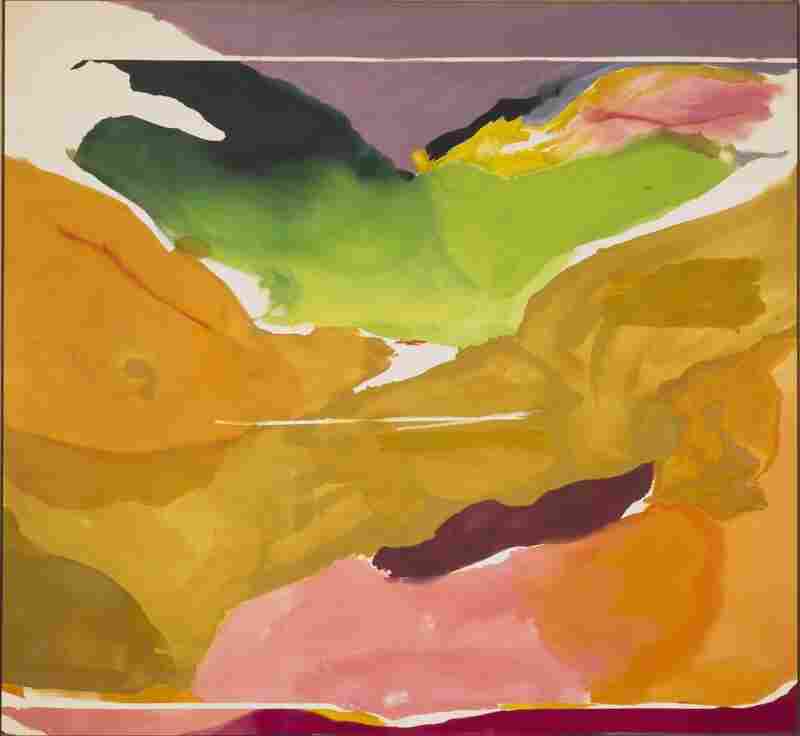 Starting with the 1952 masterpiece Mountains and Sea, Frankenthaler produced a body of work that was a major influence on the painters of the 1960s and beyond. "She really helped pull art out of the angst and trauma of the abstract expressionists, the wartime generation, and into a lighter, more lyrical kind of modernism," says Betsy Broun, who directs the Smithsonian American Art Museum in Washington, D.C. "I think it was a relief, a liberation." Frankenthaler was born into a prosperous family in Manhattan, the youngest daughter of a state Supreme Court judge. After college, she moved back to New York and struck up a romantic relationship with prominent critic Clement Greenberg, who introduced her to the major players of the art world, nearly all of them men. She later married and divorced the well-known abstract painter Robert Motherwell. Frankenthaler did not try to be a spokeswoman for feminism, but her very success was an inspiration, says Ann Temkin, chief curator at the Museum of Modern Art in New York. "Art was an extremely macho business," Temkin says. "For me, there's a great deal of admiration just in the courage and the vision that she brought to what she did." Frankenthaler had her critics, too. They dismissed her work as "merely beautiful," as somehow lacking the depth of her fellow abstract expressionists. But Earl Powell, director of the National Gallery of Art in Washington, D.C., rejects that charge. "It is not cloying," Powell says. "It's not pretty in a pejorative sense. But it really rises to challenge the best work of her time." Frankenthaler also looked beyond her contemporaries for inspiration — to the drawings of the old masters. "I often look at an old master not in terms of its subject matter, but of the placement of color and line," she told NPR in 1989. "And as an artist, not as a critic or a writer, I want to get at why — what's making this work? If I were doing this picture, what would I be doing? What would I be feeling? I often say I would be swiping this color, or I'm swiping the placement of these colors on the surface of my picture." In much the same way that today's artists and painters in the future will continue swiping the colors and lines in Frankenthaler's works.